Amsterdam (= Paris), (Duchesne), 1762. 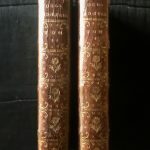 8vo, 2 vols., pp. XIV, 268 (2), 16; VIII, 306 (8 leaves plus 2 blanks). 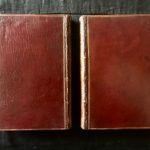 Contemporary red morocco, spine with gilt flower and title label, covers with triple-gilt fillet border and a gilt flower in every corner, inside covers gilt. 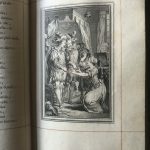 First volume contains one engraved portrait of La Fontaine, plus 39 engraved plates illustrating the fables, second volume contains an engraved portrait of Charles Eisen and 41 engraved plates, designed by him. In total four vignettes and 53 beautifully engraved head and tailpieces within the two volumes. A fine wide-margined copy ruled in red throughout. Based on Boccaccio, La Fontaine’s fables consist of a number of allegorical stories and popular tales of a moralistic nature. 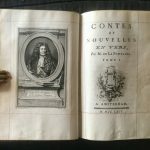 This edition is known as the ‘Fermiers-Generaux’, as the author was commissioned by the farmers-general, or tax-farmers, a large body of men who collected the indirect taxes levied by the French crown. No expense was spared to produce a copy commensurate with the wealth and position of this group. 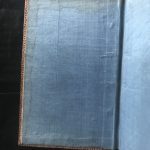 The last five stories are not actually the work of La Fontaine: ‘La Couturière’, ‘Le Gascon’ and ‘La Cruche’ are by Auterau; ‘Promettre est un et tenir est un autre’ by Vergier and ‘Le Rossignol’ is attributed to Lamblin or to De Trousset de Valincourt. 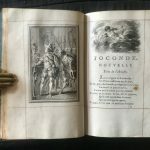 The ‘Dissertation sur la Joconde’ at the end of the first volume is by Boileau. 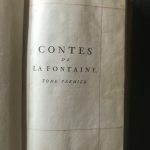 The engraved portraits of La Fontaine and Charles Eisen (1720–1778) in the first volume are by the French artist, Hyacinthe Rigaud. Cohen-De Ricci. pp. 558–68. Leslie A. Morris in ‘Visions of a collector’ (1991), pp. 277–9. Lewine, pp. 278–80.